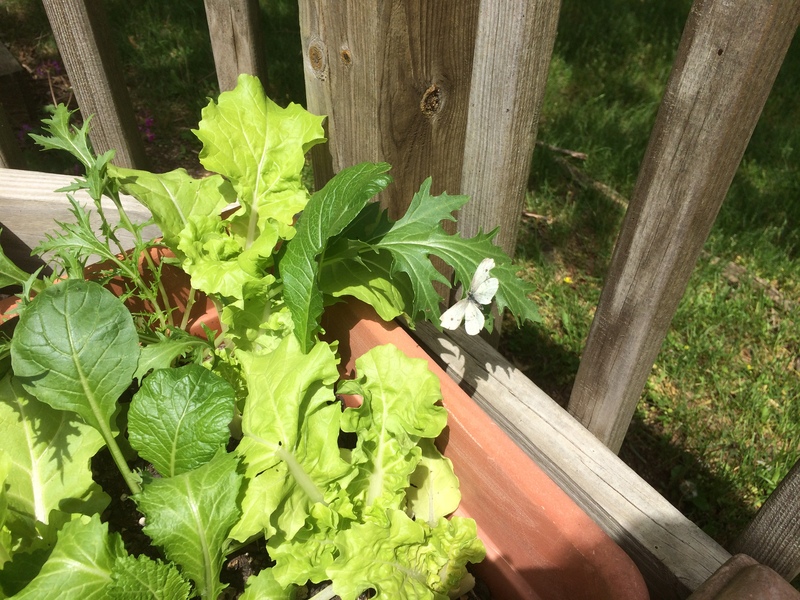 I was harvesting my lettuce this morning when a flash of white flitted by the kale. My heart stopped: spring was over; the summer battles have begun. Last year, I spent an enormous amount of time fighting the dreaded imported cabbageworm. The white butterflies, the adult form, are attracted to members of the cabbage family. In our family that means kale. The small, whitish butterflies lay yellow, bullet-shaped eggs under the leaves. Within a few weeks, the larva, the disgusting green worms, decimate leaves and stems. They then pupate and more adults emerge so within a growing season there are several generations. Surprisingly, they continue until late fall in my Northern Virginia area. 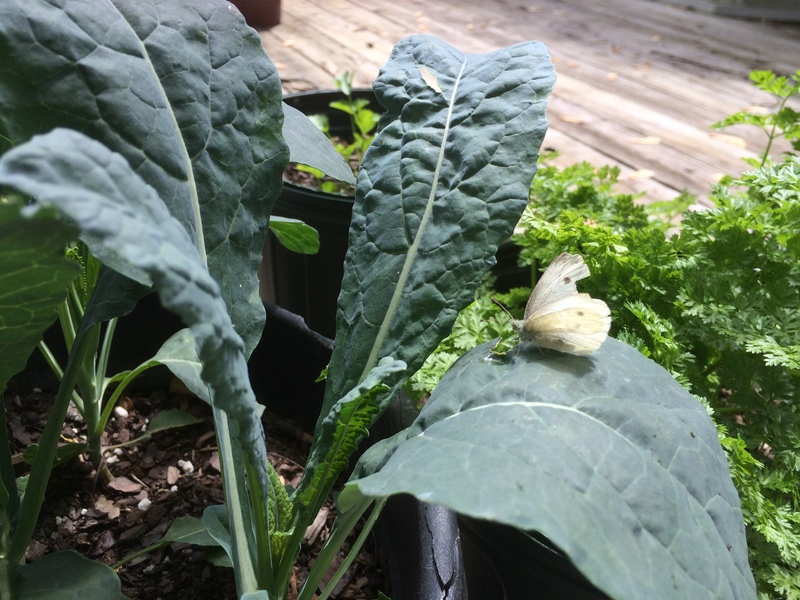 I thought a cold nip in the air would help with a fall crop of kale but not so, butterflies and worms continued to appear after Thanksgiving. At first, I tried picking the worms off but quickly concluded that: first, it’s gross; and second, it’s easier said than done. It is difficult to pick them a continuous basis especially if you are working full time and raising a family. It seems eggs are always hatching, larvae are always present from very tiny to very large, and the green color of the worm blends in with the green leaves. I know the other recommendation is to use row covers but my kale plants are in pots on the deck or tucked in the landscape, not in rows. I do not have a traditional vegetable garden where there are rows of one crop. I could put the row fabric on top of a bunch of kale but this would look ridiculous. Finally, I resorted to Thuricide®, a liquid form of Bacillus thuringiensis (Bt), thinking that I would just have to spray once or twice. Bt is a form of bacteria that kills the larvae thus a non-toxic, biological insecticide. However, it got to the point where I felt that all I was doing was spraying instead of growing and eating. By the end of the year, I was fed up and vowed not to grow kale again. It wasn’t worth it but it did make me wonder, what do farmers do when they grow kale in my area? They would be faced with the same problem. If they used row covers that would be great, I would be willing to buy their kale. But if they used a chemical pesticide, I would want to know. This spring, the kids wanted me to grow kale again. Of course, they did not know my travails; they did not pick worms off or spray plants. Like the good mom, I planted some in containers and some in the front garden. Can’t wait to try that new battery operated bug zapper! This entry was posted in Uncategorized and tagged butterfly, cabbageworm, kale, worm. Bookmark the permalink.